The Laneige Two Tone Lip Bar and the Witch's Pouch Selfie Like Shot Dual Lipstick have a lot of similarities, mainly because the two lipsticks feature dual tone, something which we don't see in our conventional lipsticks. When I was looking for a dual tone lipstick, I was torn between these two. I saw both of it on Althea and couldn't decide which one to get, so I got both of it to compare. Laneige has good reputation for its skincare. It is also one of the famous Korean brand in Malaysia. Witch’s Pouch have no brand presence in Malaysia. Very creamy, buttery and moisturizing. It glides smoothly with minimal effort. It is smooth as well, but it doesn’t have that creamy and buttery texture compared to Laneige. Pigmentation wins the Witch’s Pouch. For more pigmentation, add a few layers and the colour turns more vivid and brighter. Good pigmentation. But not as good as Laneige. Some of the contrasting colours hardly shows the gradient look. But the closer shades are able to achieve the gradient effects easier. Easier to achieve gradient effect due to the colour contrast that are closer. It has longer staying power due to the high pigment. It lasted about 6 hours. It has shorter staying power. Lasted about 4 hours, which is pretty decent time range. The square shape tube takes a few times to get familiar to. Easier to handle due to the round shape. Our hands are familiar with the round shape tube and it is easier to hold while applying. More options that Witch’s Pouch. 8 variants available. Only few options available. Three variants available on Althea. Very basic packaging. Product dispense through twisting of the tube. Only available on Althea online. Overall, I think both of them have really good potential. You wouldn't regret getting any of it. However, in terms of pricing, the Witch's Pouch is still the pocket-friendly choice. If you have not tried dual lipsticks before and just want to test the water, go for the Witch's Pouch. Althea has amazing deals on this. I believe I paid only RM25 for it. And if you are a picky user for lipsticks, Laneige is a better option because of the texture and longevity. I find myself reaching out to the Laneige more because it glides smoother and I don't have to reapply my lipsticks that often. You can also get this on Althea or you can visit Laneige counter to try out all the available colours. Althea price is 50% cheaper than the retail price, so do take advantage on that. Again, I will be promoting my Althea referral. 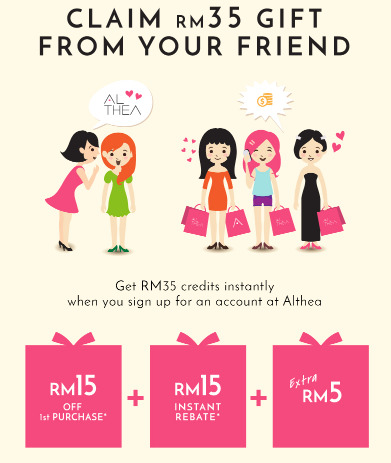 You will receive a RM35 shopping credit if you sign up on Althea using my referral link <<here>>. I'm not Althea ambassador nor I earn any commission from your purchase. I will get a RM10 shopping credit once you sign up and in return, I can purchase the products using the voucher.